Raise your hands if one of the first writing rules you learned was “write what you know.” I know many of us write about what is near and dear to our hearts, but what kind of novels would we have if we only wrote what we knew? For me, writing what I know would be the stroke of death for my storytelling. I’ve always been a wanderer at heart–I need to be able to roam outside my own boundaries. In fact, I began writing stories set in Ireland before I’d visited the country for the first time. Take that, rule-meisters! I wouldn’t be here at all if I’d obeyed the write-what-you-know rule. The story of Kilmoon’s birth began with what I call my drawer novel, a tale filled with druids and lost manuscripts. (Quite the tale, yes.) I chose to set Drawer Novel in Ireland for many reasons, chief of which was my odd and unlikely fascination with an ecological anomaly called The Burren that I’d read about in a memoir. I wrote Drawer Novel in a state of heady cluelessness. If I’d listened to the naysayers who insisted I write what I knew, I wouldn’t have written the novel in the first place, much less traipsed off to Ireland for after-the-fact research that led me to stumble on the inspirations for Kilmoon. In research mode, I happened to land in Lisdoonvarna village, which just happened to host a matchmaking festival each year. And, my B&B just happened to be located down the lane from Kilmoon Church, a thousand-year-old early Christian relic with only a tiny fingerpost to mark it. Don’t ask me why I fell in love with Kilmoon Church, but I did. It really is a tiny, falling-apart place, but it sits peacefully on its plot, crumbling in the sea winds, brooding over its gravestones. In fact, the sense of Kilmoon as a thing that can brood never left me, and in the novel it turned into: Kilmoon Church stood in genteel isolation, open air to the night as if shrugging off its Christian ties and embracing a more benevolent lunar goddess. The church seemed to watch us, indulging us our frail humanity and our unseemly trespass. We strolled around the site, taking in the uneven stones and skinny windows, the crumbling gravestones and tall Celtic crosses. When I eventually set Drawer Novel aside, I found a matchmaking festival (and by association, a matchmaker) and Kilmoon Church waiting for me. On one hand I had what’s on the surface—happily-ever-afters—and on the other, secrets long buried. I love a good juxtaposition! So I wrote Kilmoon, and then I planned another after-the-fact research trip, this time to attend the matchmaking festival and learn something about the Irish police. Sometimes knowing too much ahead of time can hamper the creative process. That’s all the reason I need not to write what I know. I completely agree, Lisa! I didn’t know anything about Josephine’s life and had never been to any of her haunts when I wrote Becoming Josephine (though I had spent time in France and the Caribbean elsewhere), but writing about her life drove me to want to know more. I’m off to see Malmaison this summer and can’t wait! How did that writing rule come to be anyhow? Doesn’t make any sense. And, oooh, Malmaison–tinge me green! Lisa, I writing friend told me “write what you want to know.” I think that’s better. My drawer novel was something I “knew” – and while it wasn’t bad, I don’t think it has the life of my current sub-genre, police-procedural – which I love to read, but didn’t write because I didn’t “know” anything about police work. So much happier that I decided to find out! Yes! I like that motto much better, Mary. Research is fun–I had a blast research Irish police stuff. Here’s a secret: I’ve never been to India, even though part of VINTAGE takes place there. Lots of research, curiosity, and great Indian-American beta readers helped me get those scenes right. And your Indian scenes read great! The rule, as generally stated, is nonsense. We’d have to throw out most of Shakespeare, for example, since he never lived in ancient Rome or Egypt or most of the other times and places he wrote about. This is what makes mystery writing possible, for example. Most mystery writers have never committed or solved a murder, but they’re writing for a readership who are in the same situation. I think there are some (few) situations where “write what you know” does apply. If you’re fifteen years old and have never had a serious relationship, don’t try to write a book about marriage — because a lot of your readers are or have been married and they will know better than you. Other than that, I think it can be safely ignored. Hi Anthony! There’s a reason we’re fictionistas — we have great imaginations. So we CAN get into the head of different personality types. You know when someone says, “XYZ lacks imagination” or that kind of thing? I’ve never understood how people can lack imagination … But I guess that’s true for some. I wonder what kind of thoughts they have? Purely literal? Great post, Lisa! This rule is total bunk. 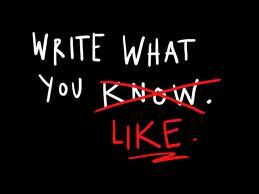 Write what you want to know or understand is a much better guideline. Since we write about crimes, we’ve got some built-in mystery to explore. I think it’s safe to say whoever coined the phrase “write what you know” didn’t know very much about writing. The whole point of writing is discovery. Like you, I wrote Chasing the Sun because there was so much I didn’t know that I wanted to explore through fiction. What a boring world this would be if we only wrote what we knew, what was right in front of us. What a complete waste of imagination that would be. Exactly! There’s a reason we have imaginations to go along with our writing skills. Since the time of the caveman, storytelling has always been about journeying beyond what we know. Amen, Sister! When I was a teenager my drawer novel was a spy thriller. I didn’t occur to me how clueless I was. Then in college I got hit with the dreaded “write what you know” commandment and I became hopelessly blocked- for like ten years! The only thing we need to know to write good stories is what it’s like to be human.